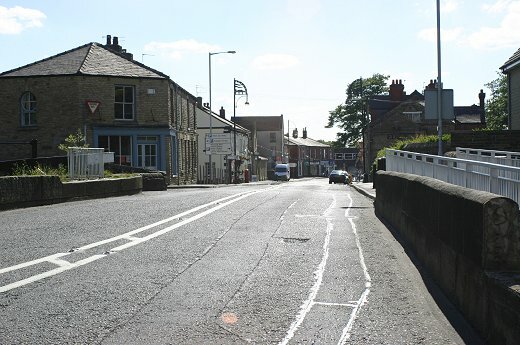 The official name for Bridge number 18 is 'New Mills and Stockport Road Bridge', although it's better known as Posset Bridge. It was built during the last stages of construction of the locks and Samuel Oldknow, who was anxious that one of his boats should be the first to navigate them, was concerned that it may not be finished in time. Oldknow encouraged the workmen by providing them with ale possets for breakfast. These were prepared at the nearby Navigation Inn and must have been a success as the bridge was finished in 1804, in sufficient time for Oldknow's boat 'Perseverance' to make the first trip through the locks when they were completed. Looking down Stockport Road from Possett Bridge with Lock 13 and the Liberal Club in view. 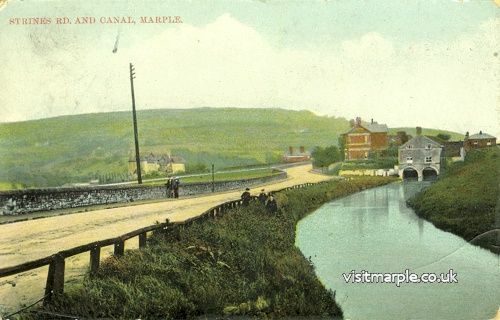 The photograph above, dating from the turn of the last century, shows the view from Posset bridge looking towards the centre of Marple. 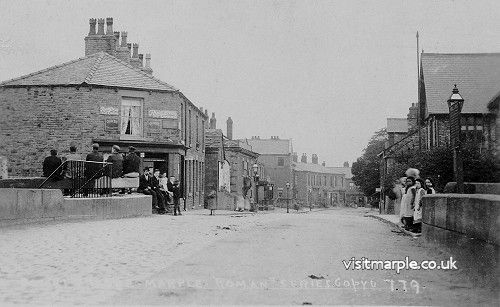 Like so many others, this old picture demonstrates just how popular Marple was with visitors in those days. The modern picture below shows a remarkably similar scene today, without the crowds. Posset Bridge comprises three separate arches. The one on the left when approaching from Lock 12 is where the canal used to branch off to the Lime Kilns. This is now filled in and the route that the canal arm took alongside Strines Road has been landscaped and houses built on much of it. The central arch serves the main canal and is adjoined to Lock 13. On the upward side of this arch is a date stone, which is all but completely eroded away. At present the date of 1804, when it was completed, can still just about be made out but sadly not for much longer as the surface is flaking away. There is a narrow walkway and curved steps that allow the boatman to manhandle his craft into and out of Lock 13 and gain passage to the other side just past the entrance to the horse tunnel. It's worth the trip though but be careful as the steps are steep and can be slippery. The third arch is a narrow oval tunnel that was built to allow the horses to pass through after being untied from their boat. Known, obviously, as the 'Horse Tunnel' it now serves as an excellent miniature subway under Stockport Road and is used extensively by walkers, cyclists and boaters travelling along the canal. 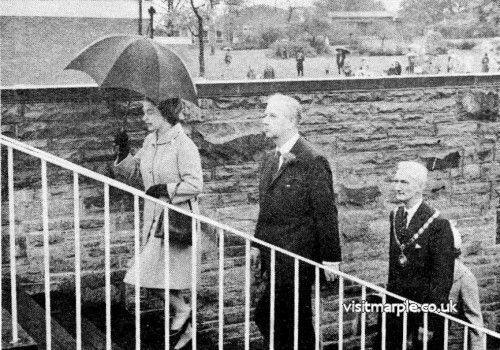 The steps leading down from Stockport Road and the area around the bridge were tidied up by Marple Civic Society in 1968 and the award-winning project was visited by Her Majesty the Queen. A new footbridge extension recently replaced the one constructed in 1968, which had deteriorated badly. In June 2016 a Transport Society Red Wheel was unvealed at Possett Bridge by President of the Transport Trust, the Right Hon. Sir William McAlpine and Canal & River Trust’s Chief Executive, Richard Parry. Stockport Road from Possett Bridge - Mark Whittaker. Sue Day at the Horse Tunnel and Red Wheel Unveiling - Arthur M Procter.